The quality and feel of this paper is great it is thick and durable. To obtain a flawless seam would require more than one roll due to the repeat pattern, however even with mistakes it's not very noticable. I've received lots of compliments on how real it looks! This user was entered into a sweepstakes after submitting their honest review. 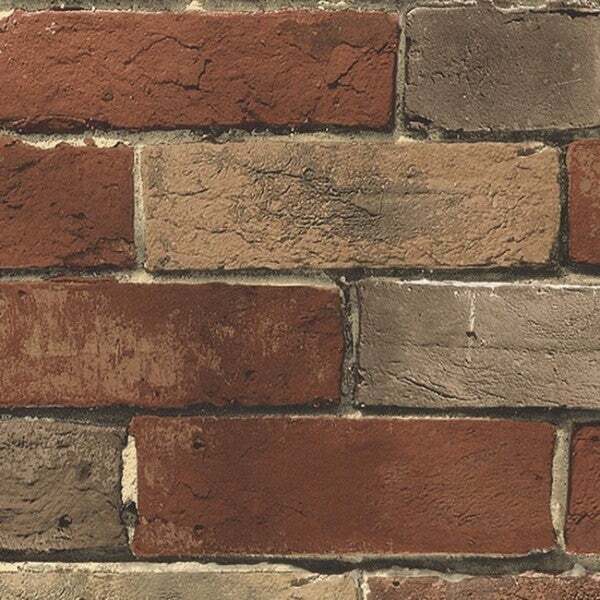 Improve a boring wall with this Weston rust brick wallpaper. This peel-and-stick wallpaper is easy to install and adds color and texture to your decor. The vinyl coating ensures that it durable and washable. Trendy Brick Wallpaper Design to Enhance Your Indoor Settings. The quality and feel of this paper is great it is thick and durable. To obtain a flawless seam would require more than one roll due to the repeat pattern, however even with mistakes it's not very noticable. I've received lots of compliments on how real it looks! The wallpaper I purchased is high quality and extremely easy to apply to the wall. I did the backsplash of my wall and it looks great. My daughter loved it so I did her kitchen the same way. Very disappointed with the overall look. I guess there's nothing like the real deal. Unless you have a rental or dorm this will definitely not be a substitute for anything resembling brick. "What is removing wallpaper like? I live in an apartment home and will need to restore wall back to original wall." wall covering should peel off. apply spritz of water and gently use a trowel to loosen from wall. may be a small amount of residual paste left behind but that will come off with warm water and a sponge. "Is it damage free when removing? " "those this cover stick on"
"How much square feet does this wallpaper cover?"